The painting represents the Expulsion from Paradise, the Original Sin of Adam and Eve with the eventual judgment of all humankind. The two figures, both naked, are fearing the wrath of God. This work of art is composed of six figures. The naked Adam and Eve extend their arms, trying to protect themselves from God's punishment. God's left hand expels them from paradise, while His right hand delivers a blessing. The position of the fingers in God's right hand has been taken from the blessing hand of Christ, as in Byzantine icons. In Yoyita's conception, in spite of their sin, God blesses Adam and Eve, and therefore humankind, because he directs them to procreate and perpetuate the lineage. Adam and Eve, along with God, are in a different plane outside paradise. The earth is barren, symbolizing the arduous work they have in front of them. We can see the top of the tree of life in the center of the garden, which is conceived as emanating light, guarded by the inamicable cherubs. At the top we have the sword of flames guarding the tree of life. The cherubim have on the top of their helmets the different faces as described in the Bible: the face of a lion, an eagle, an ox and a man. Each cherub also has two pair of wings. After Adam's fall Paradise is guarded against our First Parents by cherubim who are clearly God's ministers, though nothing is said of their nature. Only once again do the cherubim figure in the Bible, viz., in Ezechiel's marvellous vision, where they are described at great length (Ezekiel 1), and are actually called cherub in Ezechiel, x. The Ark was guarded by two cherubim, but we are left to conjecture what they were like. It has been suggested with great probability that we have their counterpart in the winged bulls and lions guarding the Assyrian palaces, and also in the strange winged men with hawks' heads who are depicted on the walls of some of their buildings. The seraphim appear only in the vision of Isaias, vi, 6. Cherubims : an assyrian word that means Karibu (the one who prays). Ezekiel 1 6 And every one had four faces, and every one had four wings. Ezekiel 1 8 And they had the hands of a man under their wings on their four sides; and they four had their faces and their wings. Ezekiel 1 10 As for the likeness of their faces, they four had the face of a man, and the face of a lion, on the right side: and they four had the face of an ox on the left side; they four also had the face of an eagle. Ezekiel 1 11 Thus were their faces: and their wings were stretched upward; two wings of every one were joined one to another, and two covered their bodies. Ezekiel 10 8 And there appeared in the cherubims the form of a man's hand under their wings. Ezekiel 10 20 This is the living creature that I saw under the God of Israel by the river of Chebar; and I knew that they were the cherubims. Ezekiel 10 21 Every one had four faces apiece, and every one four wings; and the likeness of the hands of a man was under their wings. The Garden of Eden (from Hebrew Gan Ēden, "גַּן עֵדֶן") (Arabic jannato aden جنة عدن) is described in the Book of Genesis as being the place where the first man, Adam, and the first woman, Eve, lived after they were created by God. The past physical existence of this garden forms part of the creation belief of the Abrahamic religions. The creation story in Genesis relates the geographical location of both Eden and the garden in relation to four major rivers (Pishon, Gihon, Hiddekel, Euphrates), as well as in relation to a number of named regions (Havilah, Cush, Asshur or Assyria) (see Genesis 2:10-14). This seems to suggest a setting in the ancient near east, specifically somewhere in Mesopotamia. However, because the identification of these rivers has been the subject of much controversy and speculation, a substantial consensus now exists that the knowledge of the location of Eden has been lost. There is yet no other indication found of its existence beyond the record found in Genesis and other early Judaeo-Christian literature, such as Jubilees. 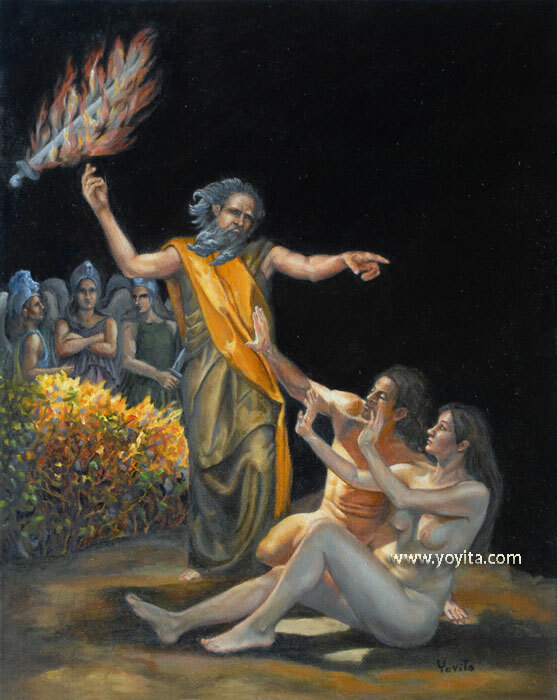 The Book of Jubilees, canonical to this day in the Ethiopian Orthodox Church, relates a tradition that the angels did not place Adam in the garden until his 40th day, and his wife Eve on the 80th day. Later on (4:23-27), it states that they also conducted Enoch into the garden of Eden when he was translated from the Earth at age 365, where he records the evil deeds of mankind for all time — adding further that the garden is one of four holy places that the Lord has on Earth, the other three being Mount Sinai, Mount Zion, and the 'Mount of the East' (usually assumed by scholars to mean Mount Ararat). The Assyrian Tree of Life is represented by a series of nodes and criss-crossing lines. It is an important religious symbol among these peoples. It is often attended to by Eagle Headed Gods/Priests or the King himself. In China, carvings of a tree with a bird on top and a dragon at the bottom were discovered fairly recently. The dragon, of course, often represents immortality in Chinese mythology. In Germanic paganism, trees played (and, in the form of reconstructive Heathenry and Germanic neopaganism, continue to play) a prominent role in Germanic paganism, appearing in various aspects of surviving texts and possibly in deity names. The tree of life appears in Norse religion as Yggdrasil, the world tree, a massive tree (sometimes considered a yew or ash tree) with extensive lore surrounding it. Perhaps related to the Yggdrasil, accounts have survived of Germanic Tribes honoring sacred trees within their societies. Examples include Thor's Oak, Sacred groves and the Irminsul. A tree of life in the form of ten interconnected nodes is an important part of the Kabbalah. The tree of life appears in the Book of Mormon in a revelation to Lehi (see 1 Nephi 8:10-12). It is symbolic of the love of God (see 1 Nephi 11:21-23) and sometimes understood as salvation and post-mortal existence. In Shinto, trees were marked with sacred paper symbolizing lightning bolts, as trees were thought to be sacred. This was propagated by the fact that after they passed, ancestors and animals were often portrayed as branches on the Tree. Among pre-Columbian Mesoamerican cultures, the concept of "world trees" is a prevalent motif in Mesoamerican mythical cosmologies and iconography. World trees embodied the four cardinal directions, which represented also the four-fold nature of a central world tree, a symbolic axis mundi connecting the planes of the Underworld and the sky with that of the terrestrial world. Directional world trees are also associated with the four Yearbearers in Mesoamerican calendars, and the directional colors and deities. Mesoamerican codices which have this association outlined include the Dresden, Borgia and Féjerváry-Mayer codices. It is supposed that Mesoamerican sites and ceremonial centers frequently had actual trees planted at each of the four cardinal directions, representing the quadripartite concept.